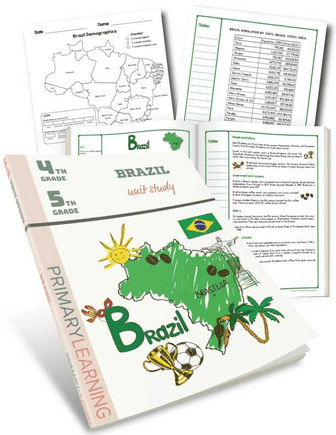 This is a curriculum unit about Brazil, Brazilian geography, culture and food for educators teaching grades 4 and 5. The main goal is to introduce students Brazil geographic location, culture, and food in a meaningful and fun way. This unit consists of three lesson plans with one-week duration. Students encourage working independently and in a team, building the essential social skills. Total: 24 pages (including cover). Brazilian music will be an asset and will create a Brazilian spirit (you can find one right here). Geography. Students will use geographic tools to collect and interpret data. They will apply these skills to create legend, symbols, scales, compass roses and be able to complete the map. Students know how to use maps. 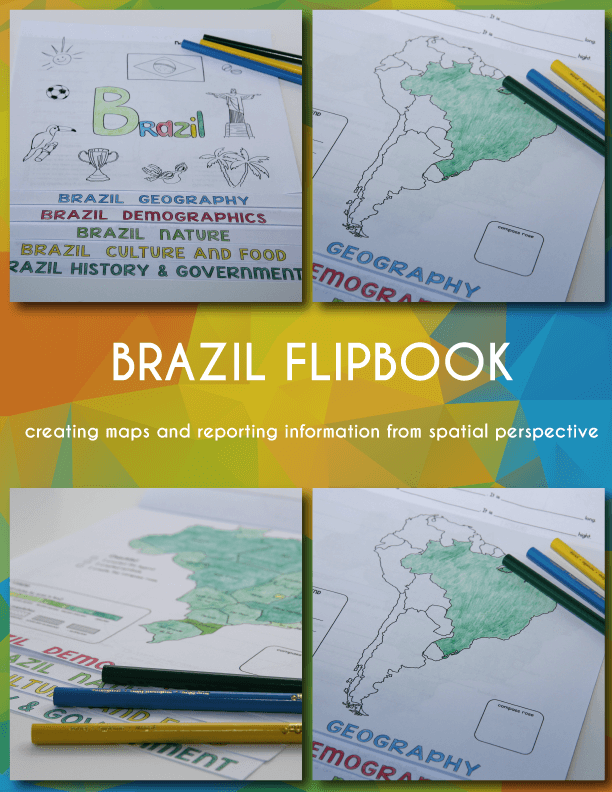 Students can report information from a spatial perspective. Social studies. Students will apply critical thinking skills and organize the information from different sources. Students will analyze, categorize, and identify effect-cause relationships, comparing summarizing and make predictions. Math. Students will identify patterns and relationships (compare and contrast using Venn diagram). They will describe the relationships between set of data in graphic organizers (maps, tables, diagrams). Literature. Students will practice writing explanatory texts. They encourage using punctuation, capital letters, and spelling grade-appropriate words correctly. Music. Students will understand the relation of music and culture. Lesson 1. It is an introductory lesson and the most extensive one. Students will locate Brazil, states, countries, and rivers on the map. 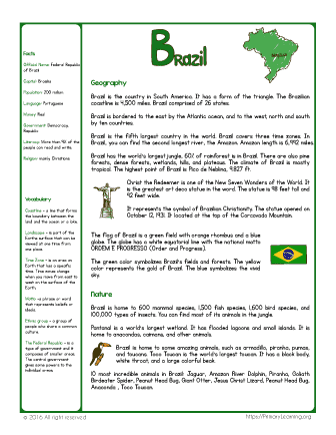 Students will read an article about Brazil. 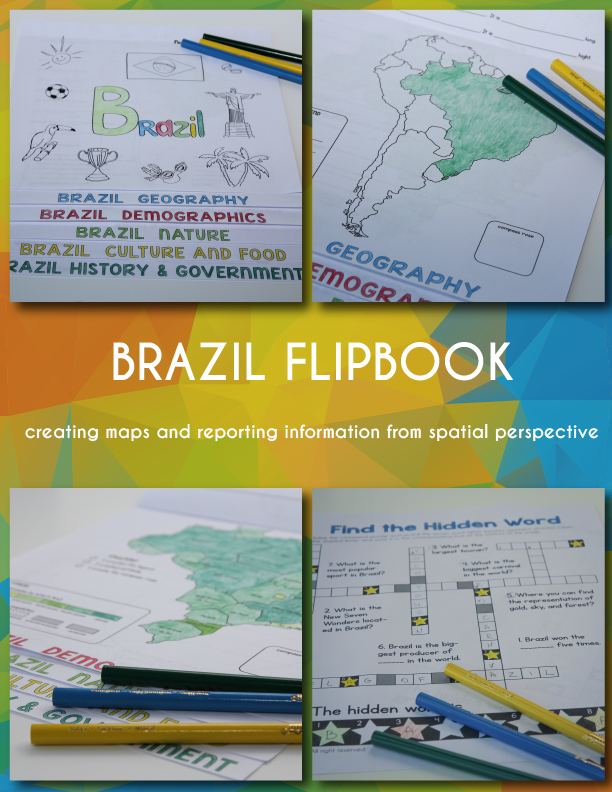 Students will start creating a flipbook and work with maps. Lesson 2. Students will make independent research to answer questions about the nature of Brazil. The will use a computer and the internet to complete their work. Lesson 3. Students will explore the people, culture, and food and make research in teams.